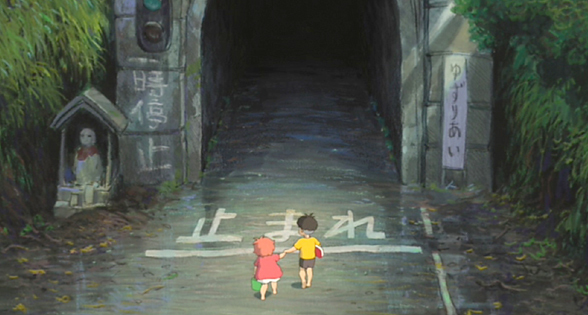 Sosuke and Ponyo approach a tunnel – reminiscent of Spirited Away? Ponyo finally gets its UK release this week, eighteen months after Japan. Why do we have to wait so long? Miyazaki Hayao has to be one of a handful of major directors from the last 25 years, yet he isn’t properly appreciated in the UK – other than by the growing number of anime and manga fans. A moan first in that the UK distributor Optimum seems to have forced arthouse cinemas into a position where they will have to show afternoon screenings in the American dub. Evening shows can use the Japanese soundtrack with subtitles. This seems to me a lost opportunity. What better chance is there for progressive parents to introduce their offspring to the joys of subtitled films from around the world than via Studio Ghibli? The problem lies with adults not children. Get them used to subs as young as possible when they are adventurous and willing to explore. A lot of fuss seems to have been made about how closely Disney have worked with Studio Ghibli on Ponyo but I’m sure that we’ve heard this before for Spirited Away and Howl’s Moving Castle. I’m sticking with the Japanese dub. Ponyo takes us back to Miyazaki’s masterpiece My Neighbour Totoro (1988). That film was in some ways a nostalgic look at 1950s rural Japan which by the 1980s had for many disappeared into urban sprawl – taking with it several of the redeeming features of Japanese family life. Although ostensibly a narrative for small children, full of wonder and delight, My Neighbour Totoro is also stuffed with cinematic references and adult themes about rural/urban differences and the support of close communities. Its simple drawn animation style manages to create images that resonate for viewers of 1950s Japanese films. It also establishes Miyazaki’s grand themes – about ecology and the narrative possibilities of (young) female-centred stories. Ponyo celebrates the Japanese affinity to the sea and foregrounds Miyazaki’s concerns about the pollution in the waters around Japan. It also appears to be somewhat biographical in terms of Miyazaki’s own family experiences. The narrative is a version of the Little Mermaid, retaining several features of Anderson’s tale, but transforming it through Miyazaki’s authorial concerns and stupendous artist’s imagination.The mermaid equivalent here is a rather special goldfish, the daughter of an underwater wizard and a sea goddess, ‘Granmamare’. The fish escapes the confines of the wizard’s realm and ends up in the possession of a small boy, Sosuke, who is playing at the water’s edge. The fish licks a tiny wound on the boy’s hand and the taste of human blood has dramatic effects which will in turn lead to the emergence of a little girl after a series of spectacular events. ‘Ponyo’ is the name given by the boy to the fish. Ponyo’s attempt to become human destroys the balance of sea, sky and land and threatens the existence of the coastal community (and by extension the rest of the world). Like the Little Mermaid, Ponyo will be faced with a choice which also involves something that only Sosuke can provide. The choice must be made if the world is to be saved. One otherwise clueless US critic is reported to have written that the film is only suitable for those under 5 or on hallucinogenic drugs. Well, those two groups might indeed enjoy it most, if only because they won’t be worrying that it isn’t appropriate for grown-ups to enjoy animation. But anyone with any aesthetic sense whatsoever is likely to just drink in the wonders of Miyazaki’s imagination and the skills of his animators. I wish I understood why traditional anime look so stunningly beautiful but CGI bores me rigid. Most, not all, western animation seems to depends on narrative – the images themselves, as images, are not that interesting. Miyazaki creates stunningly beautiful images for riveting stories. There is at least one frame in Ponyo that recalls the woodblocks of Hokusai and Hiroshige. A view of the school and old people’s centre on the coast road. I’ve chosen the print by Hokusai above because of the angle, the effect of the hats worn by the peasants (cf the umbrellas in Ponyo) and the imaginative way in which Hokusai presents the sea. Miyazaki has similar ideas in Ponyo. 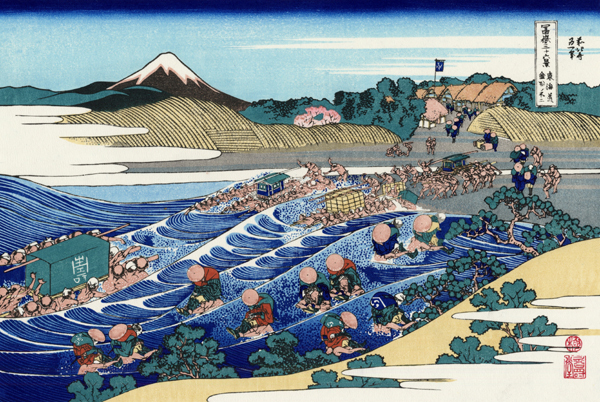 The Hokusai image is one of ’10 additional prints’ added to the ’36 Views of Mt. Fuji’ in the early 1830s. Ponyo is set further south on the Inland Sea. The triangle formed by the cliff-top house where Sosuke and his mother live, the ship at sea carrying the boy’s father and the school/old people’s centre is the centre of the world Miyazaki has created. It neatly represents the social concerns about an ageing population, an economy that still needs the resources of the seas and that perennial fascination for Miyazaki, the self-reliant children, seemingly confident because there is a community of supportive adults who are there when needed. 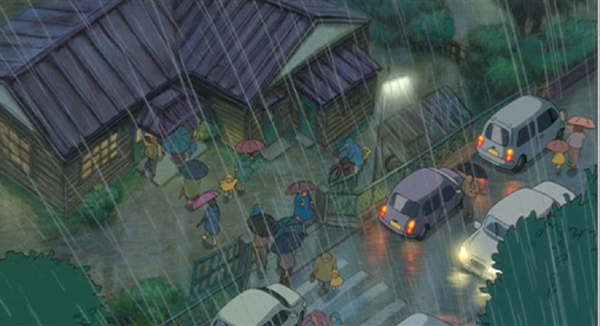 Jonathan Ross, in one of his more lucid comments on Film Night, made the perceptive comment that in Ponyo, Miyazaki (writer and director) spends time on everyday incidents involving children and adults – such as sharing a cup of soup – in which this sense of a community of all ages, not just parents and their own children, comes across so forcefully. In short a film for small children and adults of all ages – and for cinephiles who will really appreciate a maestro at the top of his game. This entry was posted in Animation, Films for children, Japanese Cinema and tagged anime, Miyazaki. Bookmark the permalink. A quick point re. the languages. Optimum isn’t forcing cinemas’ hands on this. In the case of National Media Museum, I asked for the film to play that way. I think Ponyo will appeal most to children of about 5-7 years, for whom reading subtitles for 100 minutes will be a tall order, I think. I canvassed opinion with some (progressive) colleagues with children of around that age, and they convinced me this was the way to make the film accessible to as many people as possible. If the target audience were very much older, as for Spirited Away and Howl’s, I would have gone with subtitles for all shows. At least people have the option which version to see. …according to Optimum the release took so long because Miyazaki himself was supervising the English dub! Thanks for these points Tom. As you know, I’m no expert on children and viewing conditions, so I bow to the experts but I’m still worried about this release. I’ve just heard somebody say that another well-known UK arthouse is only showing the American dub and there seems to be a concerted effort to promote the American version ahead of the Japanese one. Your reference to Miyazaki supervising the dub only slightly explains the delay since according to IMDB the film went on general release in North America in August 2009. So the question remains as to why we had to wait another six months. That’s true, I guess the lengthy dub gestation isn’t the whole explanation – it could be that Optimum decided to go for this half term release, rather than Christmas when the market for younger children’s films is busier. I think the intended audience demographic has swayed pushing the English dub version in trailers etc. If the film’s to be successful, it will have to reach the younger children that it was made for, so it will have to be mostly English dubs. I think that the adult audience would be a definite secondary consideration for this particular Miyazaki. A few (British) adults I spoke to who were introduced to Miyazaki with Spirited Away were disappointed after seeing Ponyo (in the Japanese dub) and expecting something of the complexity of Spirited Away, rather than something made for the under-7s most in mind. I think that’s a shame for sure as I think Ponyo is great, and I agree that Miyazaki is very special indeed. Incidentally the Japanese adults I’ve spoken to about the film had no problems taking to Ponyo, as they can see Miyazaki’s films more in the context of his other work. I am worried that some cinemas aren’t offering both versions. NMeM can do this because we can play the digital drive in 2 versions, but I guess many places would be limited to 35mm. In that case I can understand why they went for the English dub. With interesting looks like this one at the wonderful ‘Ponyo on the cliff by the sea’ (a so much more evocative and poetic title than the truncated ‘Ponyo’) you really do make the case for global film. How it didn’t get nominated for best animated picture at the Oscars is beyond me – but maybe the beauty of the work (so much more than the candy-coloured pabula created by Pixar) is beyond them. Thank you for this, especially the insight on traditional woodblocks.